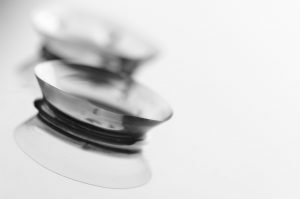 Toric lenses are used for people with astigmatism (irregular curvature of the eye). The way that toric contacts work is they have different powers at various places on the lens and they stay in place on the eye with a weighted section so that they don’t rotate. Unlike a regular prescription contact lens that can rotate and give consistently clear vision, the toric lenses have to stay in one position. Most wearers will never notice the weighted section. Gas permeable lenses are not soft and flexible like the ones most people imagine when they think of contact lenses. These lenses still have breathability for air to reach your eye, but they are rigid. By keeping their perfectly rounded shape, the lenses can help give clear vision to people with high astigmatism. The downside is that some people find them hard to become accustomed to wearing because they feel the lens more than they feel soft lenses. Usually within a few days most patients adjust well to the lenses. People who need reading glasses or progressive lenses can benefit from bifocal and multifocal lenses. These are designed for those who require more than one prescription in the same lens—a common need among people over forty due to common age-related vision problem known as presbyopia. Hybrid lenses are made of a rigid middle zone and a soft outer rim. They are specially designed for high astigmatism, certain irregular corneas, and people with early stage keratoconus.